What log entry did I read last? If you click the button below, we'll use a cookie to keep track of the last log entry you visited. Whenever you visit the site in the future, using the same computer, you'll see a link in the right-hand menu of the home page that will take you to the next log entry, so long as a later entry has been posted since your last visit. Hello and welcome to our Locost website. For those who landed here through a spurious link that had nothing at all to do with cars, you may not know what a Locost is. A Locost is a sports car you build from scratch. A lot of people around the world are building them, but not so many that you're likely to see one on the street in the next several days. 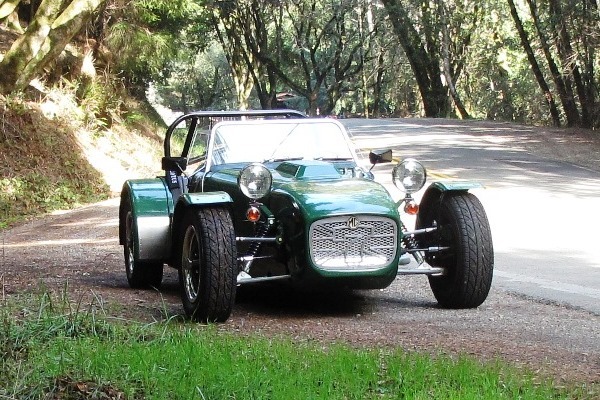 A Locost looks something like a Lotus 7, which may mean nothing to you unless you're old enough to remember the British TV series The Prisoner, and caught the episode with Patrick McGoohan tooling around London in his Lotus 7. We built our Locost over a two year span from 2011 to 2013, using a 1972 MGB for many of the parts that we couldn't make in our garage with simple hand tools, like for example the engine and transmission. We completed the car in October of 2013, licensed it for the street in February of 2014, and have enjoyed a great many rides in the car since. It's been amazingly reliable, fun to drive, and attracts attention wherever it goes. We started this website back in 2011 when we first got the idea to build a Locost. During the build we faithfully maintained a running log of our activities, and that log is still available here in case you have a couple hundred hours to kill (it's long). Our old build plan page, which we used during the build to track our hours is still around here somewhere. We also have a few articles about Locosts on the site, and we add more from time to time. While building our Locost we decided to write a couple of manuals. The first is a workshop manual for our car, so we'd have something to use as a reference when we completely forgot how we put the car together. The second is a construction manual, which we wrote to keep anyone who wanted to build a car like ours from making the same mistakes we did. Both manuals are available free as downloads from this site, however neither is complete, so you may want to wait on that for a year or two. It turns out that building a car from scratch involves thousands of details. I'm not sure we covered them all, but we tried. Of course that means we ended up with hundreds of log entries, so we also kept a running summary of the build, and if you want to know how we went from a pile of steel to a finished Locost, but don't want to slog through pages and pages of build details (and frankly, who would? ), the summary page should give you some idea of what we went through.